A descendant of German soldiers and farmers, Gary’s family is from Reinbeck and Waterloo. This lifelong resident of Iowa is a graduate of Waterloo West High School and has three degrees from the University of Northern Iowa (B.A. Science teaching, B.A. Elementary Education, and M.A. Mathematics). He also served in the navy as a quartermaster. 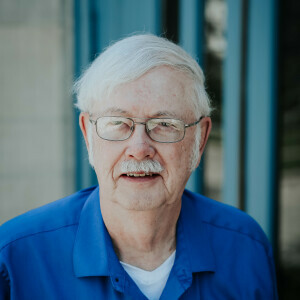 Gary began his teaching career in 1969 and taught 5th grade science in Fort Dodge from 1977 to 2010. At various times, he also taught math and reading. From 1979 to 2010, he was the supervisor for the summer youth baseball program in Fort Dodge. Though Gary and his wife Rosie, a 4th grade teacher for 37 years, raised their two daughters in Humboldt, they have been members of First Presbyterian Church in Fort Dodge since the 1970’s. In retirement, Gary and Rosie moved to Fort Dodge where he taught 8th grade math and science at Community Christian School for two years and became a member of the church staff in 2010. Today, as the church volunteer coordinator, Gary is the head usher and greeter at FPC. In his leisure time, he is a golfer and a model railroader. If you are interested in volunteering at FPC or want to learn more, contact Gary at 515.890.7934.